Contents and Media: Approximately 120 parts in resin; 11 parts in clear and tinted clear resin; 5 decal sheets; 7 photo-etched sheets; various lengths of plain and coloured wire and plastic. During 2006, MDC released their debut full-kit offering, a 1/32 scale Hawker Typhoon Mk.IB. This was a remarkable kit - large, well-engineered and beautifully detailed. Early this year MDC followed up the Typhoon with their second full kit, a 1/32 scale Ki-61-I "Hien" (Tony) IJA Type 3 Fighter. This model was designed and mastered by Radu Brinzan for Model Design Construction. MDC continues its association with the talented Mr Brinzan for its largest and most ambitious project to date - a full 1/32 scale resin kit of the twin-engine Arado Ar 234 B jet bomber. This is a comprehensive multimedia offering with more than 120 parts in various coloured resin; 11 parts in clear and tinted clear resin; 5 decal sheets; 7 photo-etched sheets; canopy masks; various lengths of plain and coloured wire and plastic. The kit is carefully packed in a stout box, with parts for each sub-assembly inside a separate plastic bag. The kit features superbly fine and crisply engraved panel lines. The fuselage halves of this pioneering twin engine jet bomber are impressively large in this scale, but structurally rigid. A number of bulkheads have been built in, as well as locating pins with corresponding recesses along the joins. Test fitting suggests that, after gluing and clamping, there will be few join seams to clean up. 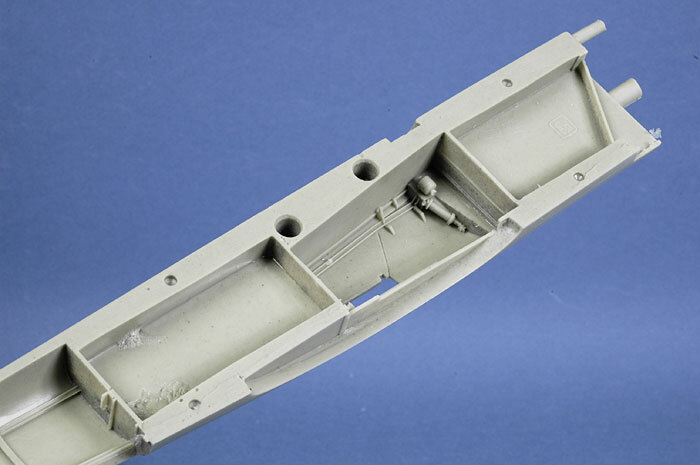 Detail has been cast inside the fuselage for the wheel well and camera bay. 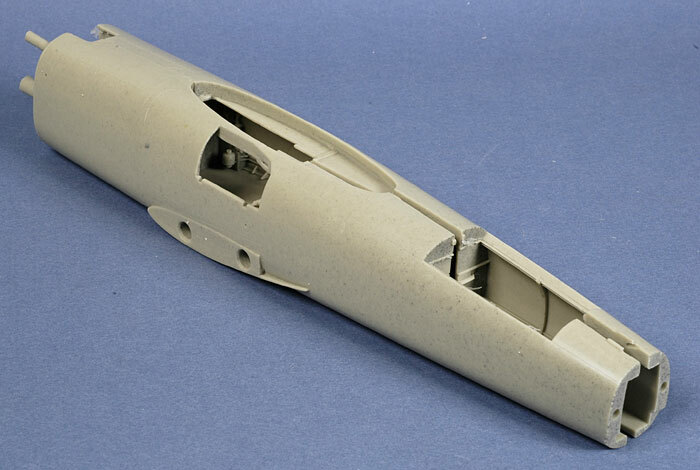 The tail and cockpit sections have been cast as separate sub-assemblies. Each wing is supplied as a single part. Once again, ease of construction has been taken into account with two large brass spars in each wing. These correspond to deep holes in the shoulder wing root on the fuselage halves. 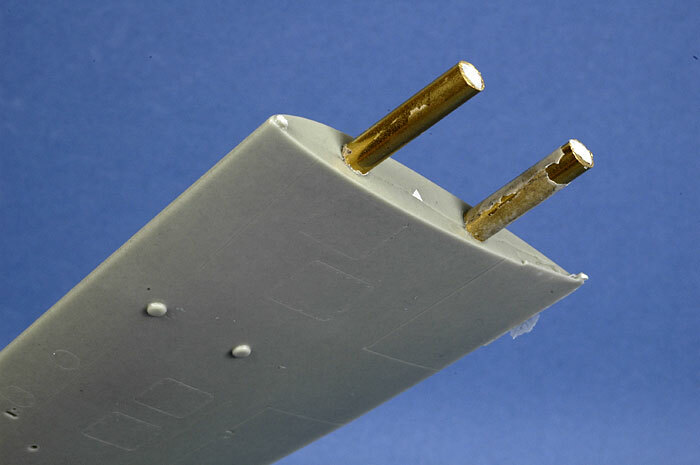 The hollow brass tubes have been filled to ensure maximum rigidity. The trailing edges are ready for the separate ailerons with recessed locating positions making it easy to position these control surfaces. The rudder and elevators are separate parts too. The cockpit of this glazed nose bomber is a real showcase for MDC's resin and photo-etched craftsmanship. This includes full detail that will look terrific behind the large clear nose. MDC instrument decals are supplied for the dials, while the harness is supplied as photo-etched parts. A jumble of ordnance options is supplied, including lovely cameras, bombs with racks, RATO packs and more. This model is borne by cast white metal undercarriage legs. The metal legs are very well cast for this tricky medium, and will look great after careful cleanup. With the weight of this beast, metal undercarriage is really the only option. I also strongly recommend using two-part epoxy glue to secure the deep locating rods in the wheel wells. 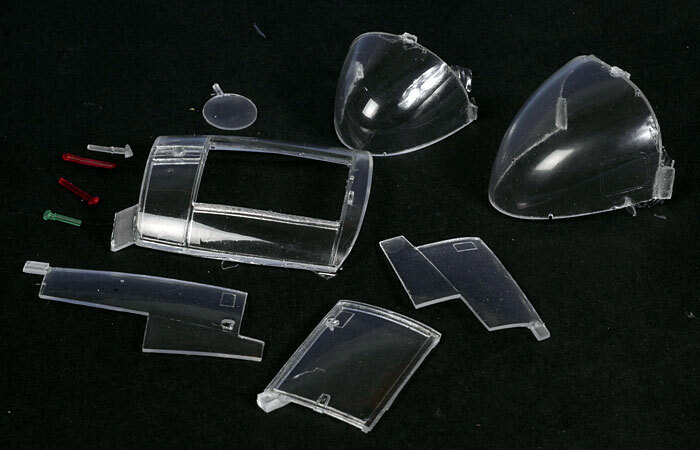 The clear resin cockpit glazings are thin, transparent and free of distortion. They should fit precisely over the resin canopy frames, and will eventually be adorned with "rivetted" decal frames. The entry hatch is supplied as a separate part and may be posed open for an even clearer view of the front office. The kit also provides clear and tinted resin navigation lights. 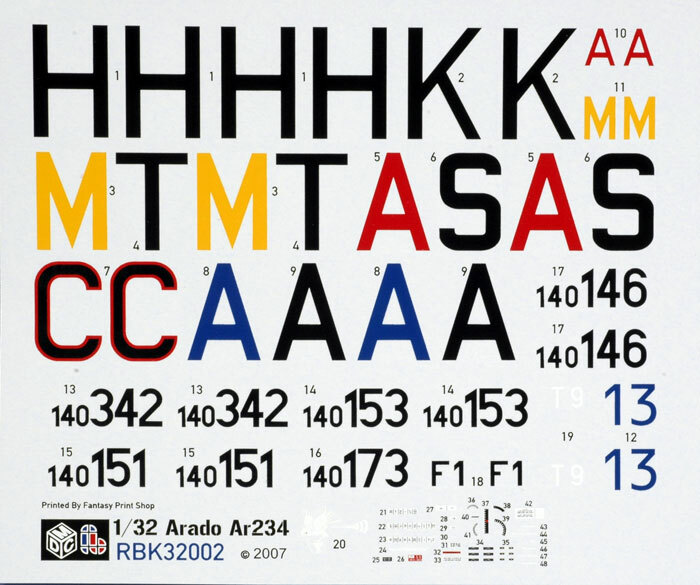 Six marking options are supplied on a high-quality decal sheet, with a separate sheet covering national markings. There will be some cleanup, but it is mostly lightweight. There are no heavy casting blocks on any of the resin parts, and no warpage evident on any parts in my sample. Experience and, perhaps more importantly, confidence will be required for this project though. MDC Radu Brinzan's brand new 1/32 scale Arado Ar 234 B is a truly remarkable kit in its ambition and its execution. It is clear that this kit benefits from MDC's cumulative experience with both the earlier Typhoon and Hien models. 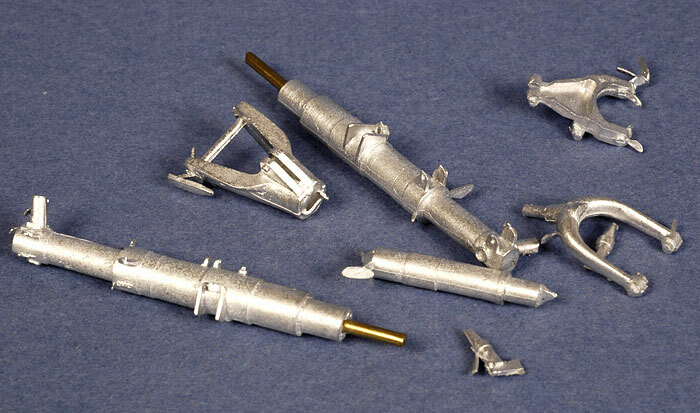 Engineering and rigidity (in particular) of this kit are improved compared to its predecessors. This Arado looks eminently buildable. 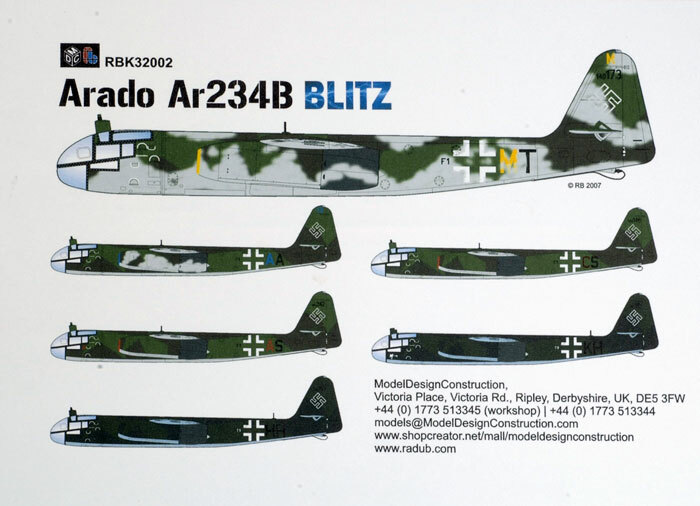 MDC Radu Brinzan's 1/32 scale Arado Ar 234 B is exquisitely detailed, inside and out. I can hardly imagine a subject better suited to showing off its highly detailed cockpit credentials than the Ar 234 with its big clear canopy glazings. You will definitely need experience with resin kits if you want to tackle this project, but MDC's thoughtful planning will make workbench time a real pleasure. Thanks to MDC for the sample.